A bird in a bathing suit? Could it really be? What a silly sight to see! But that’s exactly what this group of kids notices playing in the bird bath. At first they point and make fun of him, but then they realize he’s pretty cool after all. 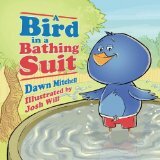 Told in rhyming verse, A Bird in a Bathing Suit is fun to read and laugh along with. It looks at the possibilities of birds in clothes with cute illustrations to bring home this humorous point. But although it’s amusing to giggle at this bird in unusual attire, the kids finally notice they’ve hurt his feelings, and that’s simply not okay. Acceptance of diversity is demonstrated in a non-preachy and enjoyable manner in this fun picture book. I highly recommend it.